Maximize the performance of your bag sewing equipment with genuine Fischbein brand sewing thread, needles, lubricants and crepe tape. 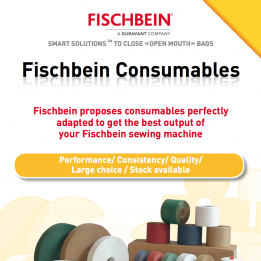 Fischbein consumable products are specifically designed and engineered to enhance the performance and longevity of your bag sewing equipment. From hand-held portable bag sewers to fully integrated bag sewing systems - Fischbein consumables are the perfect choice.